I'm very much liking the 'small story' scenarios. partly because history is better told through the lives of the people affected by it, and partly because I'm fed up of story-lines where the entire universe is in danger (again). Well, we know that the universe will ultimately be OK, or there is no more show. But the little people - that raises the stakes, because anything could happen. Very good point. Little people, like the Hindu husband, can die - and do - and we can mourn them more than we mourn an army because we have come to know him as a person. The universe only raises a question of how it will be saved, rather than having the same tension. Well, it all depends on how it's done. The fate of the universe can hang on a single, ordinary person (see Donna in Turn Left for example). So far, the stories are perfectly fine(and the historicals more than fine) but I would like something more to sink my teeth into. Hence this post, trying to make sense of what is happening. It's not a problem, I'm just delving into Classic Who instead to find more of the specific things that I like. I have been spoiled for 7 years, so the fact that so many like the current show a lot pleases me as it ought to cater to everyone. I have loved this season so far because its focused upon stories about people rather than grand cosmic tapestries that eventually fall apart under the weight of their own plot twists. Also it tends to be difficult finding something *bigger*. Chibnall tends to do character stuff well - I'm waiting for this to pay off, and hope the finale will be character centric somehow. I've really been enjoying this season. Going to check back in later when I'm not going out (I feel like I'm always saying this!) but just FYI I *LOVED* this piece of mini-meta, I think it's perfect and insightful and draws a beautiful thread through everything that's happened so far. Also - how do you always find such perfect quotes from the show?? Do you have them all in your head?? but just FYI I *LOVED* this piece of mini-meta, I think it's perfect and insightful and draws a beautiful thread through everything that's happened so far. Also - how do you always find such perfect quotes from the show?? Do you have them all in your head?? I see this moment as the one driving the very last step, the Doctor seeing himself through his past self's eyes. 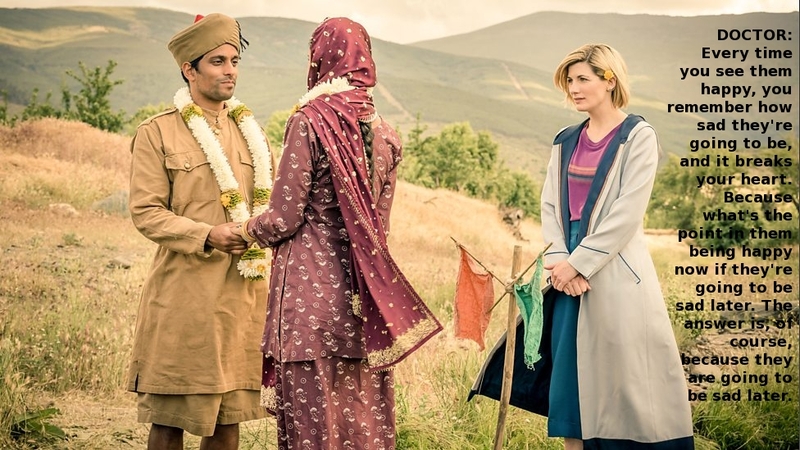 Much like Kazran did not change his ways until he was faced with his child-self, so the Doctor's final change is quite possibly due to this encounter[...]Is it any wonder that Thirteen strives to be someone her first incarnation would understand and approve of? This is SUCH a good point and analogy <3 I really like this, as the final step. Is it any wonder Twelve delves into himself to puzzle out what kind of man he really is? And despite everything, he still dies on a battlefield, war trailing in his wake [...] it's no wonder that going forwards the Doctor wants to simply 'save a few people on the battlefield', rather than fight the war. To see the 'little people', rather than trying to topple the ones at the top. I rewatched this ep recently, and I still didn't think to put that together! Well, it's not the most natural of things to compare - the thing with Thirteen is the *lack* of defensiveness, and it's difficult to appreciate something that isn't there. It makes me wonder where Thirteen would have taken her crew first, if she'd had a choice over the matter. Also how she would have reacted to that sort of pushiness, that Nine gets from Rose. Yas and co are much more chill. Yes, it's difficult to compare because the situations are so different. But look at Ten & Martha, where he lies to her to feel better... Thirteen is SO MUCH less damaged. Finally, those quotes about companions fearing the Doctor - beautifully chosen. They ARE speaking to each other, across writers and eras! I look forward to whatever yo do with it in vid form once the season is over. Ooooh, another v good point. Am going to think about this some more.